From finishes that are guaranteed to last a lifetime, to faucets that perfectly balance your water pressure. MOEN sets the standard for exceptional beauty and reliable, innovative design. This showerhead is designed to complement any decor. From finishes that are guaranteed to last a lifetime, to faucets that perfectly balance your water pressure, Moen sets the standard for exceptional beauty and reliable, innovative design. Bring elegance to your home with premium selections from Moen. From the sophistication of period traditional to the streamlined refinement of minimalist contemporary, you'll find a host of amazing ways to express your style with products from Moen. Get the most enjoyment out of your shower with this MOEN showerhead. It has an attractive oil-rubbed bronze finish and offers efficient water usage that still provides great performance. Envi delivers same showering experience while using less water. The MOEN Envi meets WaterSense criteria to conserve water without sacrificing performance. It features 3 functions to create a personalized showering experience. Wash the day away with this In2ition Two-In-One 5-Spray Hand Shower/Shower Head in Chrome. Use the integrated shower heads together or separately to get water where you need it most. With five (5) different settings, including a pause feature, this hand shower has you covered from top to bottom, or bottom to top. This super functional handshower gives you water any way you need it, anywhere you want it. Use the innovative pause function to reduce the water to a trickle, allowing you to conserve water while doing such tasks as lathering up or shaving your legs. Buy with confidence, knowing that Delta backs all of its products with a lifetime limited warranty. 4-Spray 4-3/8-inch Eco-Performance Showerhead In Brushed Nickel From finishes that are guaranteed to last a lifetime, to faucets that perfectly balance your water pressure. MOEN sets the standard for exceptional beauty and reliable, innovative design. This showerhead is designed to complement any decor. 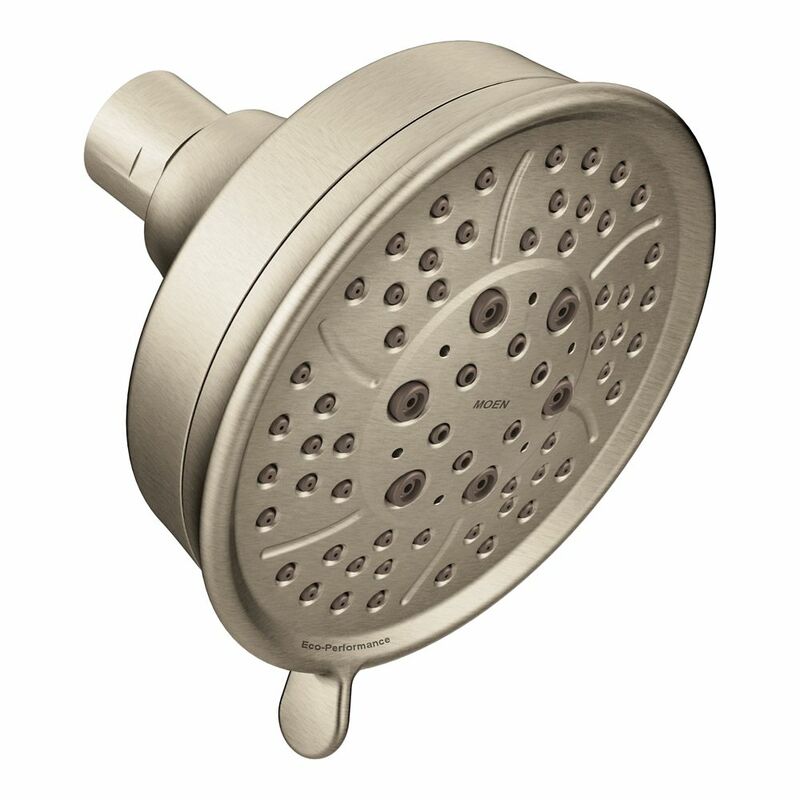 4-Spray 4-3/8-inch Eco-Performance Showerhead In Brushed Nickel is rated 4.7 out of 5 by 6. Rated 4 out of 5 by downsizer from I haven't used the new one but have an identical showerhead in our other bathroom. It works fine. I haven't used the new one but have an identical showerhead in our other bathroom. It works fine. Rated 5 out of 5 by Anonymous from Exactly what we Expect From Moen We are "refreshing" our Master and changing current Moen faucets and shower heads to oil-rubbed Bronze. We ordered this item online and it arrived within a week. This shower head was exactly what we wanted. It has 4 different spray levels and good, strong water pressure. Most other shower heads that we looked at only have one or two different spray levels. It's not a cheap plastic/thin metal head. It has a rich, traditional oil-bronze color. You won't be disappointed. My husband installed it in no time. We added a diverter and hand wand to complete the look.